One thing I remember thinking about the British during the six years that I lived in uptight Paris, is that we love a laugh. We like to take the piss out of each other, we are always looking for the next joke, we like a drink and we love a party. We are hedonists. This was amply proved once more this weekend at the Jubilee celebrations. I was lucky enough to be invited to the Nyetimber street party in Battersea on Saturday where chef Valentine Warner cooked and Rose Prince of The Telegraph baked. As well as the residents of the street, this outdoor lunch was a food lovers moot including critic Zoe Williams, food blogger Niamh Shields, food writers Lucas Hollweg and James Ramsden along with Rosie Hogg, James’ girlfriend, formerly of Books for Cooks. A long table seating 100 people was beautifully laid with snowy white tablecloths, freesias in pewter mugs, jugs of water with slices of cucumber and an abundance of the best English sparkling wine from Nyetimber. I’m a convert: English sparkling wine is easily the equal to champagne. It’s small, artisanal and we should support our growers. Vive les anglais! I’ve gone a bit Jubilee mad I must admit. I was also on the cover of The Independent on Sunday magazine with a couple of punk Jubilee recipes. 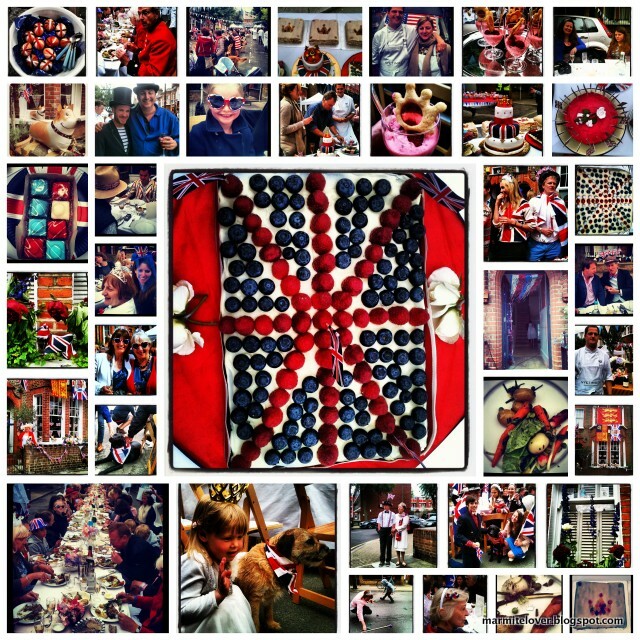 Here are two more Jubilee recipes…the possibilities are endless…give this girl a theme and I’ll run with it. Grease a baking tin (15 x 10 inches more or less) with butter. Whisk the eggs and sugar together. Add the flour and cream to the eggs and sugar mix. Pour it into the baking tin. Now, carefully make your Union Jack with the different coloured fruit. I used cherries, keeping the stems on (to better control them), for the red cross; raspberries for the red diagonals and blueberries to fill in the blue triangles. Place them individually and carefully. Your batter isn’t too deep so this will make it easier. Then, carefully, carry your tray over to the oven (adjusting some berries that may have slipped out of place) and slide it onto the oven shelf. These pancakes are thick and fluffy in the American diner style. 300ml of sour cream or full fat creme fraiche. Double cream or more sour cream for topping. Sieve the flour, baking powder and salt into a large bowl. In a separate jug/bowl break the eggs and whisk together with the cream and milk. Make a well in the middle and pour in the sour cream, eggs, milk mixture. Mix it all together but not too much. Pancake batter should always be lightly combined otherwise it creates stiff pancakes. Using, ideally a cast iron crepiere (available for about 25 euros at any French supermarket, well worth the investment), but realistically whatever flat frying pan you possess, rub a little of the butter. Scoop 2 or 3 large tablespoons of the batter, let it spread. Wait with your fish slice at the ready till you see bubbles on the surface of the pancake and you feel that the bottom seems set enough to flip over. Wiggle the fish slice underneath as far as you can get it, and flip over. It doesn’t matter if it leaks a bit. The first side will take longer than the second side. Don’t worry if the first couple of pancakes aren’t good, that’s normal. 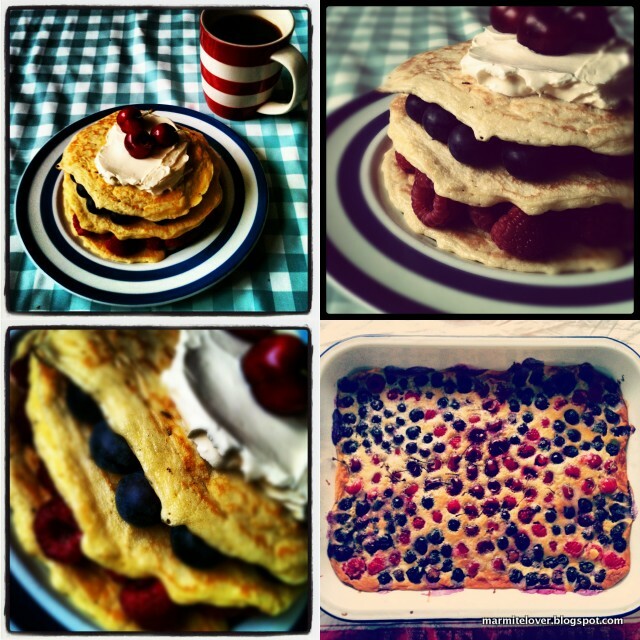 I made a short stack of three, largest at the bottom, and put different coloured berries on each layer, topping with whipped double cream and a cherry. But hey, go for it, make a long stack, six or more pancakes in a tower. 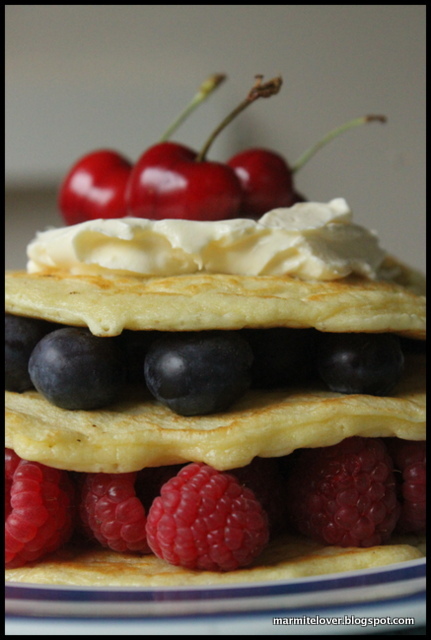 You can heat up the berries with a little sugar and alcohol to make the stack sweeter. For instance I like to ‘muddle’ the blueberries with a couple of slugs of creme de cassis and the same with the cherries and some cherry liqueur (kirsch). Or mix melted butter with maple syrup to pour over the top. What a lovely celebration! Love those colors, love those meals!